School just ended which means it’s time for the summer peak travel season. My calendar is always jam packed June through September, so don’t wait till the last minute to try and schedule something. 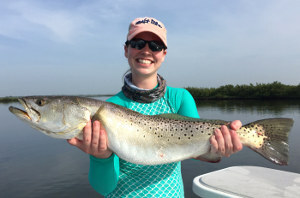 Fishing in Mosquito Lagoon and Indian River Lagoon has been phenomenal over the past 6-8 weeks. 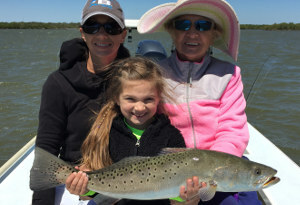 We’ve been catching 30-40 fish per day (speckled trout and redfish). 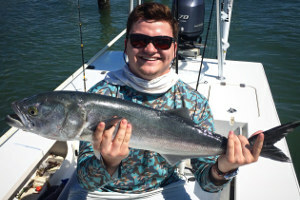 We’re also fishing for snook and small tarpon around New Smyrna Beach and Ponce Inlet. 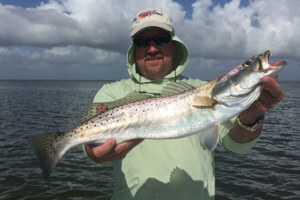 There’s crazy amounts of baitfish that have flooded our coastal waters of Central Florida. Clean, low water is yielding some great sight casting. Catching can’t get much better than it is…and it’s here to stay with not much change on the horizon for the next couple months!!! 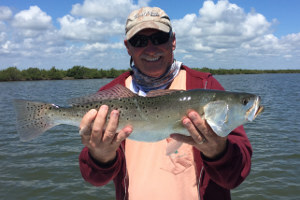 The Speckled Trout bite in Mosquito Lagoon is off the charts good! Haven’t had a day since mid-April where we caught less than 20 trout, with many days producing 30+ trout to the boat. 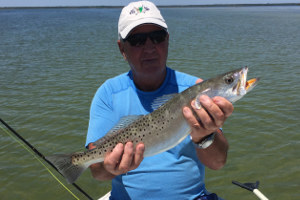 I’m not talking little peanut trout either, nearly everything coming to the boat is in the 18-24” range, with 5-10 trout each day in the 24-30” range. It really can’t get much better, in terms of numbers and size. Baitfish bite is where it’s at (mullet, pigfish and croakers). Topwater plugs and soft plastics are catching them by the dozens though too. 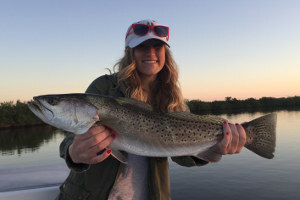 Trout bite will stay strong all summer; last july produced several fish over 30 inches in length. 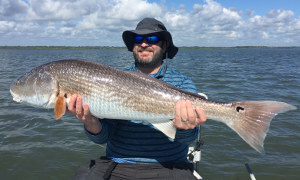 Mosquito Lagoon Redfish have been schooled up in big numbers on the shallow grass flats and bar edges. Low water is helping them stay that way. 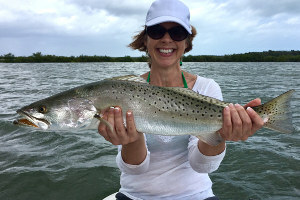 Sight casting with live shrimp, pinfish, or chunk mullet and ladyfish are working really well. Soft plastics and spoons are working well when blind or sight casting. 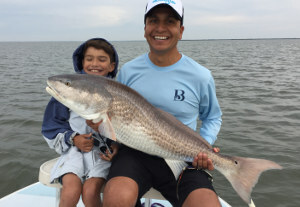 Targeting docks and bridges around New Smyrna, as well as the jetties at Ponce Inlet with baitfish is catching slot size and giant bull redfish over 20lbs. 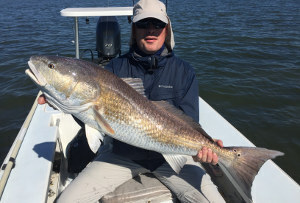 Summer months are prime time to catching giant bull redfish as they school up in massive numbers to spawn over the next few months. Snook have scattered throughout the coastal waters around New Smyrna Beach, Ponce Inlet, Edgewater and down into the Mosquito Lagoon. We’re targeting them at bridges, docks and shorelines with live shrimp and a variety of baitfish. 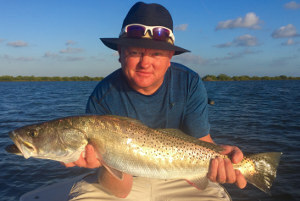 Most of the fish are in the 4-8 pound range, with the occasional fish pushing 15 pounds. Season closes for the summer on June 1, which means it’s catch and release on snook for the next few months. Lots of juvenile tarpon in New Smyrna Beach, Ponce Inlet and Edgewater are roaming the deeper channels, creeks, and sloughs. Definitely some of the most numbers of fish in the 10-15 pound range I’ve ever seen around here. We did really well on them the past few weeks when the tide has been right with shrimp, pinfish and mullet. Bigger adult tarpon have migrated up the coast and are hanging around Ponce Inlet and the nearshore beaches. Live mullet and menhaden are choice baits for this time of year. Jigs, swimsuits and surface plugs will also work inshore or nearshore.